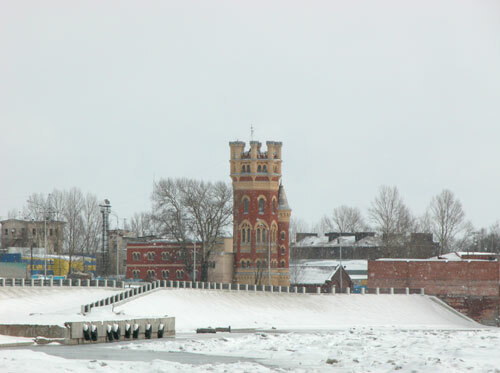 We continue further along Neva's Oktyabrsky Embankment. We are not far away from the new suspension Obukhovsky Bridge. 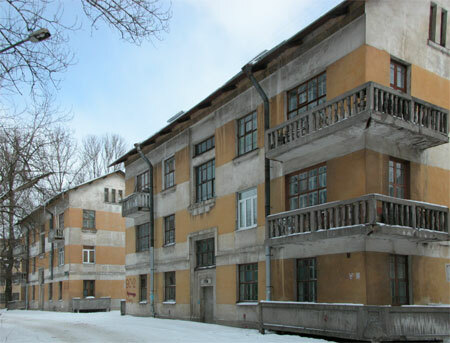 Constructivism era buildings, even though the balconies are a little bit off-style. 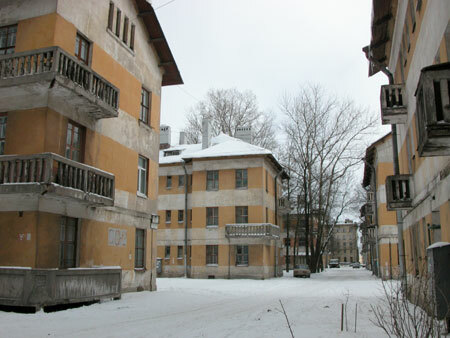 The coloring scheme is rather typical for 1920s construction of such type. 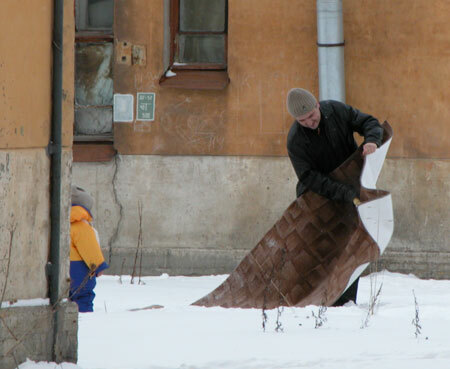 Carpet-beating is not a forgotten technique here. 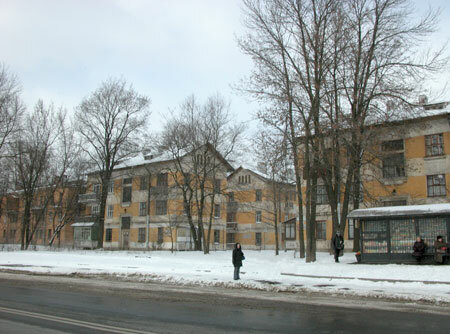 Next to the worker's housing block is the building from another period. 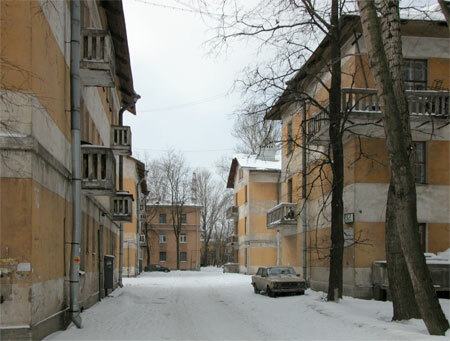 It looks almost like Stalin Empire architecture, though without bells and whistles. 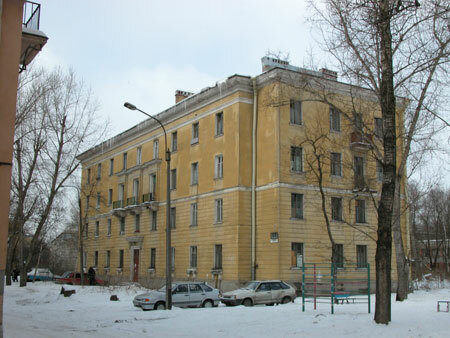 After making a side-trip to the housing let's go back to Oktyabrsky Embankment. 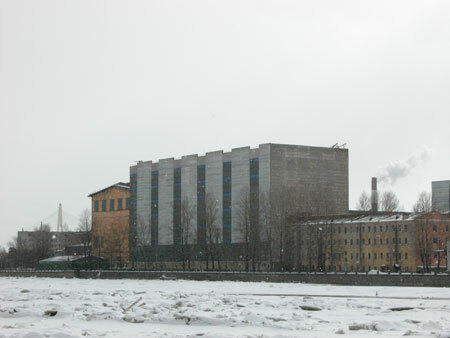 And here it is: State Power Station #5 "Red October" (Oktyabrsky embankment, 108). 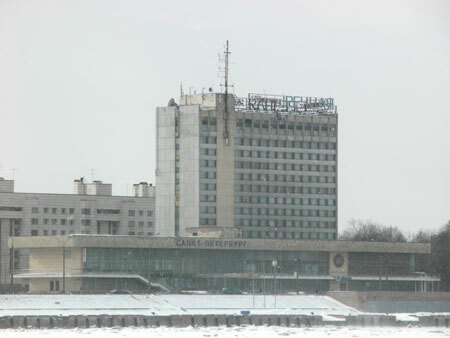 Was built in 1922 as one of the first in GOELRO plan (stands for "State Plan of Electrification of Soviet Russia"). Initially it was called merely "Duck Creek", but later renamed to "Red October". Today it is known as "ТЭЦ-5" (Heat-Electro Central #5). 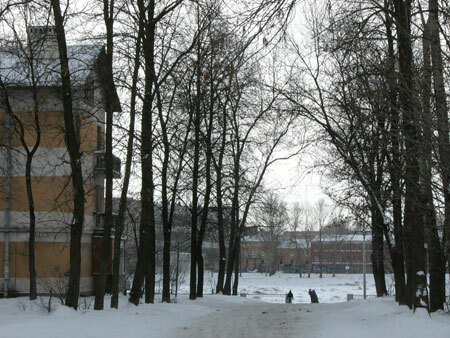 The chief project architect was Andrei Ol. His colleagues and subordinates were very fond of him and even wrote a funny poem about their Chief. A little further on the river bank we see this picturesque tower. Most likely it is a water tower. But there is another version, though: it's the gun sight tower. 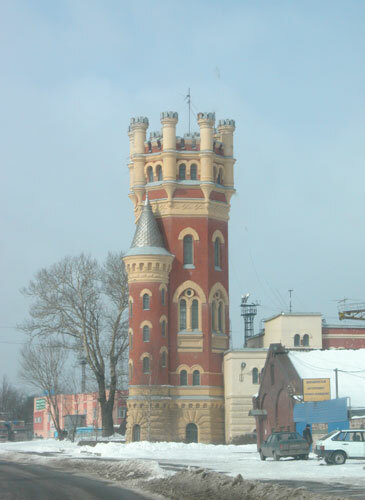 On the opposite bank of Neva there was Alexander Gun Factory, and they presumably used the tower to fine-tune their sights. In any case the tower was recently re-painted and looks lively indeed. Now let's take a look at the opposite bank of Neva. 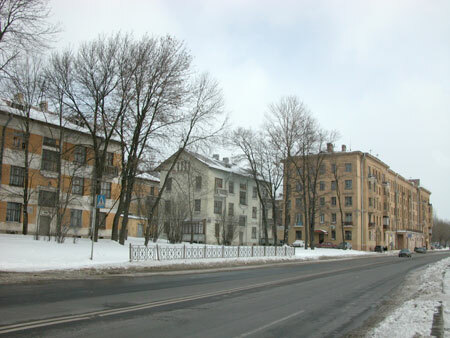 It's not embanked over there, and mostly abuts on industrial buildings of huge Obukhovsky Plant, part of Anti-Aircraft Weaponry corporation "Almaz-Antey". This is noticeable member of Russia' military-industrial complex. 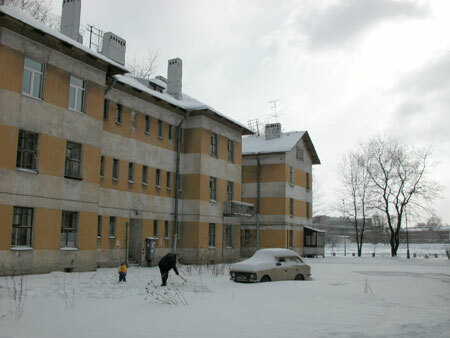 During Soviet time the plant was named "Bolshevik". 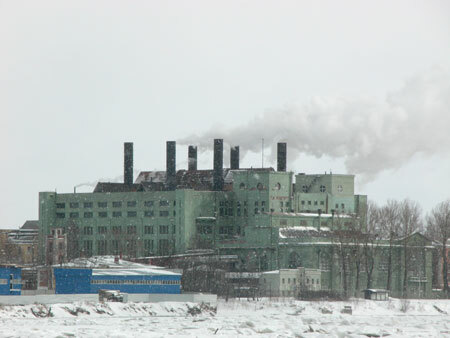 By the way, the position of industry next to the river is not coincidence at all. Quite a few technological processes require plenty of water. And at the same time they need (-ed?) a place to drop a waste. 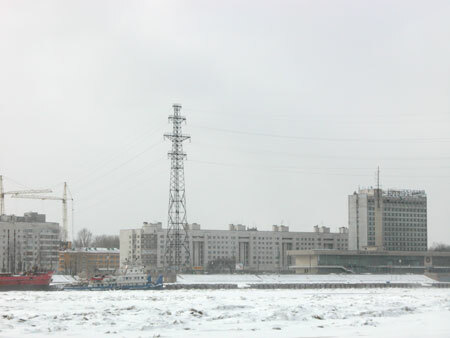 Just to the right: hotel "Rechnaya" ("River-side") and River Passenger Port (Obukhovsky Oborony Prospekt, 195). Port was opened in 1970, and was supplemented by the hotel 4 years later. If only they could repair all that! And I wouldn't mind if they removed the power transmission tower, too. If you haven't noticed already, please take a look at my new recently extended Album: "City life: Airport in Kuznetsovo", and also at two Albums about Thailand.